On this particular Saturday, my plans were completely up in the air. You see; there was talk of a backyard barbecue going down in the valley. But, once word came ‘round that the shindig was postponed; I immediately set out to find a suitable replacement that could satiate my hunger for meat. 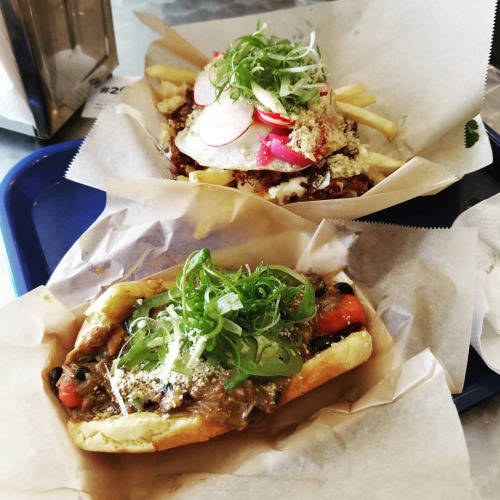 After narrowing it down to two K-town favorites—Beer Belly and Belly & Snout—I couldn’t help but gravitate toward the inventive and inviting dogs of the latter choice. So, I threw on a pair of shoes, loaded some music into my headphones and set out to have another culinary adventure. Once outside, I could tell this was a near perfect day to explore the neighborhood. The sun was shining and a slight breeze washed over me like a wave of warm cotton. I headed up the block and made my way down Western Ave. until I reached my destination. At first, it was hard to distinguish from the shops and stores that adorn much of the street. But, once I reached the opposing corner, a large white sign with an equally predominate pig silhouette was there to announce I had finally arrived. Once inside, the cozy restaurant felt warm and welcoming. A long, wooden counter split the room in half with the kitchen hidden away behind it and a few tables tucked into the corner of the foreground. My attention was immediately drawn to the farthest wall, where a multi-colored chalk menu alerted me to the day’s offerings. After taking a few moments to decide, I landed on three separate dishes that would allow me to sample a little of everything this place is known for. I started with a Two Buck Taco, filled with chicken adobo. Next, I chose the Oxtail Chili Dog that came slathered in peanut-braised oxtail, cotija cheese, garlic crema, black and red beans and cilantro. Finally, I paired these with an order of the Sisig fries, topped with pork, fried egg, red onion, chicharron, green onion and garlic crema. Admittedly, even as I write these words, it’s making me hungry for more! After ordering, I took a seat in the corner and while looking around, I noticed a plaque for Diners, Drive-ins and Dives on a wall behind the counter. As a self-loathing fan of the show, I found it a bit odd, as I had never seen their episode before. It all made sense soon enough though. While waiting on my meal, I began to cycle through my social media and when tagging the restaurant in a #foodporn post, I saw that the ever-curious enigma known as Guy Fieri had actually filmed there just a few days prior. I was Guy Fier-ious! I can’t believe I missed my chance to be on one of my favorite shows. Especially one I love to hate and hate to love. This is when my experience took an unexpected turn. While sitting there in my seat, indulging in a bit of Snapchat vanity, a couple barged in with their young child. And as soon as they reached the register, the large male of the group began to make his presence known in boisterous fashion. 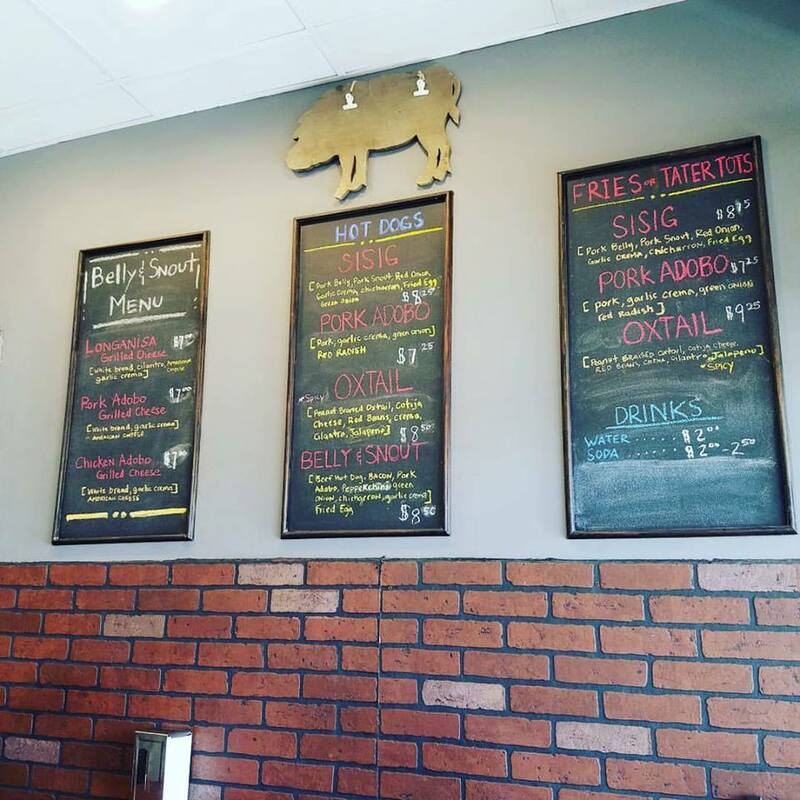 He leaned (too) far over the counter, began reading through the menu in a loud tone of voice and carried on an internal conversation that was surely deafening for everyone within earshot. Luckily, my food arrived shortly thereafter and I was once again at peace. I made quick work of the taco; an easy feat given how succulent and juicy the chicken was. Then, it was on to my hot dog, which despite my greatest efforts, I could not fully enjoy due to the couple sitting a table away. The man continued to talk louder than anyone in such an intimate space ever should and to make matters worse, he kept yelling to the kitchen staff in an attempt to ask them questions about Mr. Fieri. Couple this with his wife (or girlfriend?) taking duck-lipped selfies right in front of me and it left me with no other choice, but to sigh my way through an otherwise delectable dog. Just when I thought it couldn’t get any worse, the man began to speak to his child about time—again, much louder than anyone should—and he proceeded to cycle through a span of fifteen hours. “Do you know how long that is?” He asked. “One hour… two hours… three hours… four hours… five hours… six hours… seven hours…,” This continued until he reached fifteen. That’s right; he actually went from beginning to end. By this time, I had started into my fries, which ultimately helped drown out the man’s piercing voice that continued to permeate the room—much to everyone’s dismay. Thankfully, about halfway through, their to-go order was placed on the corner and the couple went on their way. At last! I had nothing but peace, quiet and crema-covered French fries. I took my time savoring each and every piece of golden goodness that sat before me. One-by-one, I slathered the fries in a pristine mixture of toppings and floated higher into the heavens with every bite. And upon reaching my final fry, I smiled one last smile, before concluding my K-town conquest. From there, I gathered my composure and tossed my well-worn napkins into the garbage, before wishing the Chef a good day and exiting the establishment. For a brief moment, I stood outside, the sun’s warming rays shining down upon me, and I remembered just how much a good meal can change one’s outlook on the day—even if you do have to briefly share it with people that don’t understand the meaning of personal space.